Building Pastor: Fr. Terence O’Connell P.P. Portarlington (Cúl an tSúdaire) The recess of the Tanner. The town was founded in 1666 by Sir. henry Bennet, Home Secretary to Charles II, to whom the King made a grant of the lands of O’Dempsey, Viscount Clanmalier, forfeited in 1641. Sir Henry Bennet was created Baron Arlington. He obtained a Charter, creating a Borough within part of the lands of Cooletoodera, and introduced English settlers. The Parliament of Orrery and Ormond enacted that English names replace the Irish names of places, so the Borough of Cooletoodera received the name of Port-Arlington, or Arlington’s Fort. Fr. Terence O’Connell, PP acquired the leases of the lands for the new Church site. 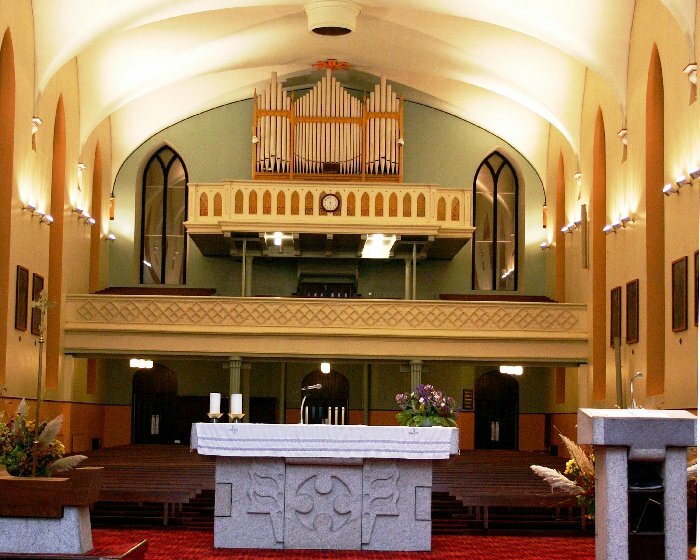 he had previously been Administrator in Carlow and worked on the large project of the erection of Carlow Cathedral. The stones used in the building of the church came from the bed of the canal being constructed between Portarlington and Monasterevin. Fr. Edward O’Leary extended the church by 20 feet in 1915 and added chan cel, side chapels, nuns’ choir, the sacristies and baptistry. He completed Canon John O’Hanlon’s “The History of the Queen’s County”, Canon O’Hanlon died in 1905 and the two volume work appeared in 1907 and 1914. A plaque in the side porch commemorates Fr. Terence O’Connell, P.P., who built the churches of Portarlington, Killenard and Emo, and who brought the Presentation Nuns (1854) and the Christian Brothers (1863) to Portarlington. Following his death in 1875 the parish was divided, with Emo and Rath becoming a new parish. Fr. O’Connell is interred in the parish church, as is his successor, Fr. Hugh Mahon P.P. (1875 – 1889). In 1971, under architect, Wilfrid Cantwell, the Church of St. Michael’s was refurbished in accordance with Vatican II.